If I were to poll 100 people about what they most need in their lives, I don’t think peace would be in their top responses. But if I suggested peace as an answer, I think everyone would nod and agree it’s a huge need. Peace seems so unfamiliar to people today that I think few consider it. Peace is like that wonderful, gifted, older second cousin you saw 25 years ago at a reunion. In the family, yes, but nebulously distant. Not someone you think about except when someone else reminds you of that side of the family, and then a positive memory or three comes back. Yes, now I remember. Really nice person. Would be good to see again. What we don’t realize is how essential it is never to lose track of peace—until peace is telling in its absence. Can’t put our finger on what is out of whack, but something is not right. More often than not, that “not right” is missing peace. Without Jesus, there is no peace. In the silent moments of our days, the disquiet enters, and we do what we must to mute it. A million mute buttons exist, and us forever pressing the nearest one. Because the disquiet shouts to us its lack of peace. Screams that something is wrong, is off, is askew, or is missing. Jesus, come, and be near us now. Jesus, let us rest in You. I don’t know what your situation is, but I can tell you this: You could use more peace in your life. May Jesus be that peace. May you rediscover a depth of trust in Him that helps you enter rest and find renewal and refreshing for your soul. God bless you Dan. Needed this today. 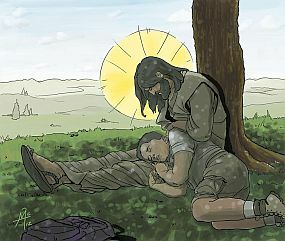 Oh what comforting picture above , of the young person resting on the laps of the master of peace ; though we are missing His bodily presence today, we are assured that so long as we continue to trust in His heavenly life principles even under extreme circumstances in the storms of life, He is ever near. Am already thinking about having someone paint me a pic. like this to hang in my room.